Great news for Alexander Skarsgard fans! Kristin Bauer, who plays Pam on True Blood, is not only a talented actress, but also a wonderful artist. 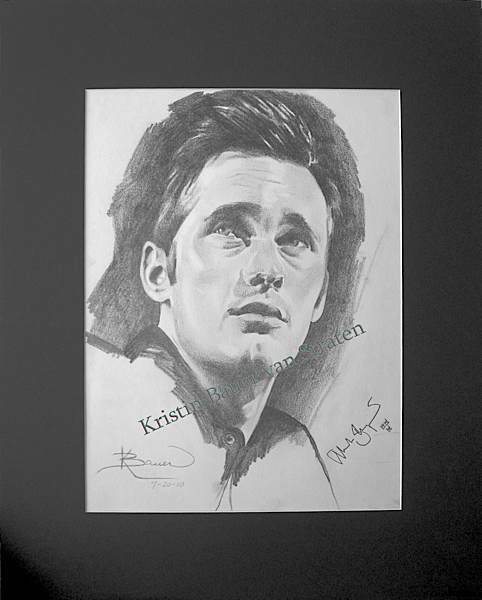 She recently did a matted pencil drawing of Alexander Skarsgard, Eric Northman. One hundred limited edition, numbered and signed prints of this drawing will be up for auction for the benefit of the Amanda Foundation. Kristin Bauer van Straten and TrueBloodNet.com have teamed up to help The Amanda Foundation. The Amanda Foundation is a pet rescue organization that was founded in 1976, and has since placed thousands of homeless animals into loving homes. A nonprofit organization, they not only rescue dogs and cats who, through no fault of their own, are spending their last days at city and county shelters but they also sponsor a free web page for those that need to re-home their furry, feathered or scaled companions; sponsor spay and neuter education programs and operate a spay-mobile; and have their own veterinary hospital. They also run a feral cat spay/neuter and vaccination program that has treated over 1000 feral cats including 200 in one day! All profits from this auction go directly to The Amanda Foundation to support their worthy work. The auction will run from September 22nd, 2010 until the run of 100 prints is sold. In order to participate, you must be registered to bid. Registering is free and registering now will get you set up for future True Blood charity auctions. Shipping, packaging and insurance will be $20.00. These high quality limited edition prints on art quality paper are numbered #/100 on the back and signed by Kristin Bauer van Straten. Unlike the picture these prints are NOT matted. They are high quality 11” x 14” art prints from the original drawing that was done in the classic black and white Harrel style of the iconic movie stars: James Dean, Elizabeth Taylor, Marilyn Monroe, Humphrey Bogart. Alex is best known to our readers as True Blood’s Eric Northman but his work as Brad Colbert in HBO’s “Generation Kill” has also been highly acclaimed. This auction is supporting a great cause! Please join Kristin Bauer and TrueBloodNet.com in supporting the wonderful Amanda Foundation and register to join in on the auction! This entry was posted in News and tagged Alexander Skarsgard, Kristin Bauer van Straten, True Blood on September 21, 2010 by admin.